"A bad bit of blowdown"
This lanternslide, entitled "A bad bit of blowdown" was taken on an unidentified section of the Long Trail. It shows the trunks of several overturned trees lying horizontally in the woods. The branches are still attached to these trees, and there are leafy plants growing beneath them. There is a man walking across the trunk in the center of the image. He is wearing boots, long pants, a tank top, and a woven knapsack with a bedroll on top. 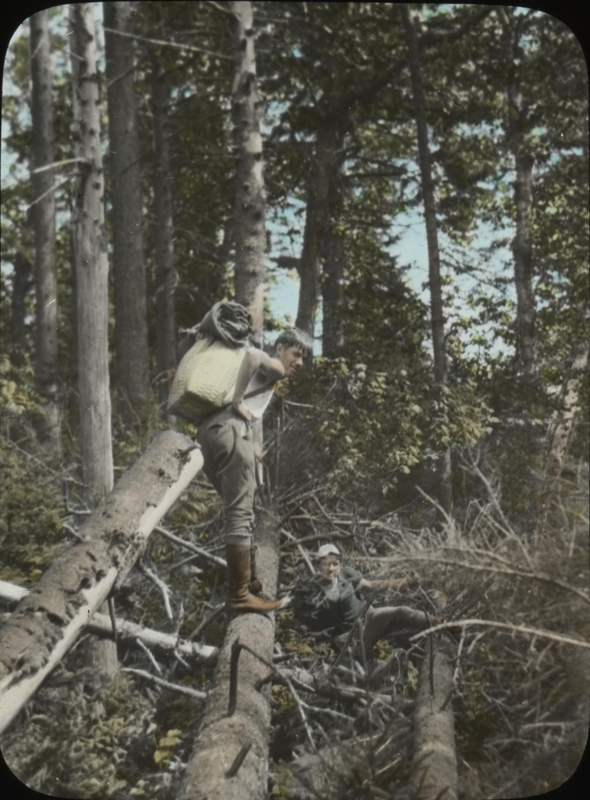 To the right, another man has climbed or fallen beneath the trunks and into the underbrush. In the background, there are multiple deciduous trees. The trees are leafy, implying that it is summer. Bob Burke writes on 2011-10-06: the blown down trees are norway spruce, a plantation species. As such this must be at a fairly low elevation.